Cochin or Kochi, is one of the finest natural harbours on the Arabian Sea coast of India. Cochin- renamed. 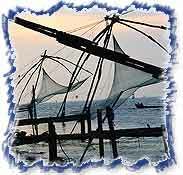 Kochi has been a port of call for foreign traders from very early times. Ancient mariners from Arabia, China, Holland, Britain and Portugal have all left their mark on this beautiful island city of Cochin. One of the finest natural harbours on the Arabian Sea coast, Cochin has been a port of call for foreign traders from early times. Its cosmopolitan character is reflected in the buildings and structures representing different regions of the world. A city of peninsulas and islands, today it is Kerala's commercial hub. Kerala's prime travel destination, Cochin spreads across islands and promontories in a stunning location between the Arabian Sea and Backwaters. Its main sections: modern Ernakulam in the east and the old districts of Mattancherry and Fort Cochin on a peninsula in the west are linked by a complex system of ferries. More popular as the Queen of the Arabian Sea, Cochin is a cluster of islands on the vast expanse of the Vembanad Lake. Some of these picturesque islands are Bolgatty, Vypeen, Gundu and Vallarpadam.The lake opens out into the Arabian Sea here to form one of the finest natural harbours in the world. It is this natural advantage that has made Cochin a fascinating blend of the cultures and influences of the explorers and traders who visited this wealthy land. » Santa Cruz Basilica - This monumental church dates back to 1558 and has beautiful paintings on the ceiling. » St. Francis Church - Built in 1503 by Portuguese Francisan Friars, this is the India's oldest European church. It was restored in 1779 by the protestant Dutch, converted to an Anglican Church by the British in 1795, and is presently used by the church of South India. Vasco da Gama's remains were buried here in 1524 and later moved to Lisbon, Portugal but his tombstone still remains. » Mattancherry Palace (Dutch Palace) - Built by the Portuguese in 1557 and presented to Raja Veera Kerala Varma of Cochin, the palace was renovated in 1663 by the Dutch. On display here are beautiful Murals depicting scenes from the epics, Ramayana and Mahabharata and some of the puranic Hindu legends. Them palace is open for public viewing from 10:00 am to 6:00 pm. all week days except Fridays. » Gundu Island - Here is the magnificent 16th century Pallipuram Fort that is open only on Thursdays. 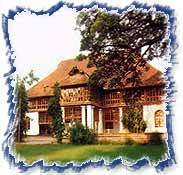 » Bolghatty Palace - A Scenic island near the city of Ernakulam, Bolghatty is famous for the Bolghatty Palace built by the Dutch in 1744 AD. This palace, once the residence of the British resident of Cochin, is now a KTDC (Kerala Tourism Development Corporation) hotel. » Ambalapuzha - Jew Town: The area around the Synagogue is a centre of spice trade and curio shops. » Cherai Beach - This lovely beach bordering Vypeen Island is ideal for swimming. Dolphins are occasionally seen here. A typical Kerala village with paddy fields and coconut groves nearby is an added attraction of this beach. » Hill Palace Museum, Thripunithra - 10 km from Cochin, Hill Palace, the official residence of the Cochin royal family, was built in 1865 AD. The palace complex consists of 49 buildings built in the Traditional Architectural Style of Kerala and is surrounded by 52 acres of terraced land with a Deer Park and facilities for horse riding. The palace museum is open all days except Mondays from 9:00 am to 12:30 pm and 2:00 pm to 4:30 pm. A full-fledged ethno-archaeological museum and Kerala's first every heritage museum are the main attractions. Displayed inside the thirteen galleries are oil paintings, 19th century paintings, Murals, sculpture in stone and plaster of paris, manuscripts, inscriptions and coins belonging to the Cochin royal family. » Pareekshith Thampuran Museum - This sprawling, traditional Kerala style building previously called the Durbar Hall, houses 19th century oil paintings, a collection of old coins, sculptures and Mughal paintings. The museum remains open from 10:00 am to 12:30 pm and 2:00 pm to 4:30 pm. all weekdays except Mondays. » Chinese Fishing Nets - These huge cantilevered fishing nets were brought here by traders from the court of Kublai Khan. » Willingdon Island - Named after Lord Willingdon, a British viceroy to India, this man-made island is surrounded by beautiful backwaters. The island is the site of the city's best hotels, customs and trading centres, the port trust and the headquarters of the Southern Naval Command. 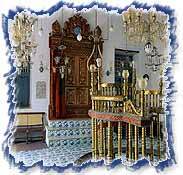 » Jewish Synagogue - Constructed in 1568, this is the oldest synagogue in the commonwealth. Destroyed in a shelling during the Portuguese raid in 1662, it was rebuilt two years later by the Dutch. Known for mid 18th century hand printed, willow pattern floor tiles from Canton in China, a dock tower, Hebrew inscriptions on stone slabs, ancient scripts on copper plates etc., the Synagogue is open from 10:00 am to 12:00 noon and 3:00 pm to 5:00 pm. It is closed on Saturdays and Jewish holidays. » Vypeen Island - There is a magnificent lighthouse at Ochanthuruth, which remains open from 3:00 pm to 5:00 pm daily.